They finally have arrived and are everywhere. 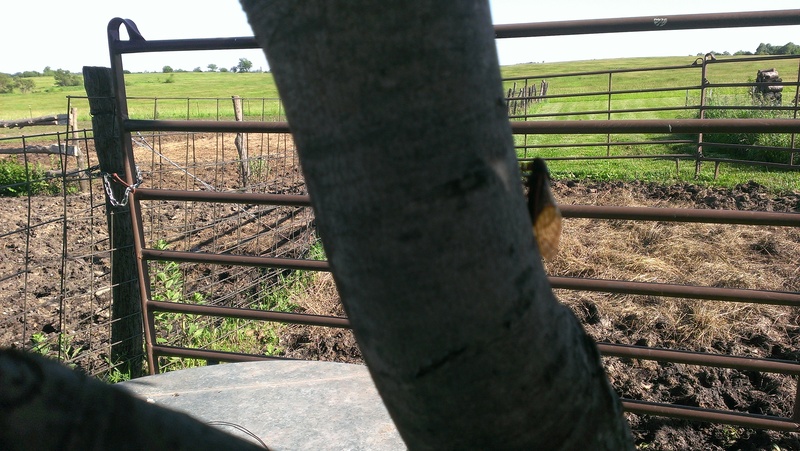 In the trees, the grass, the water tanks. Their red beady eyes are strange to look at. And the wings are see through. And noisy! At least in the evening. Thousands of them communicating with each other. Plotting who they will land on next. 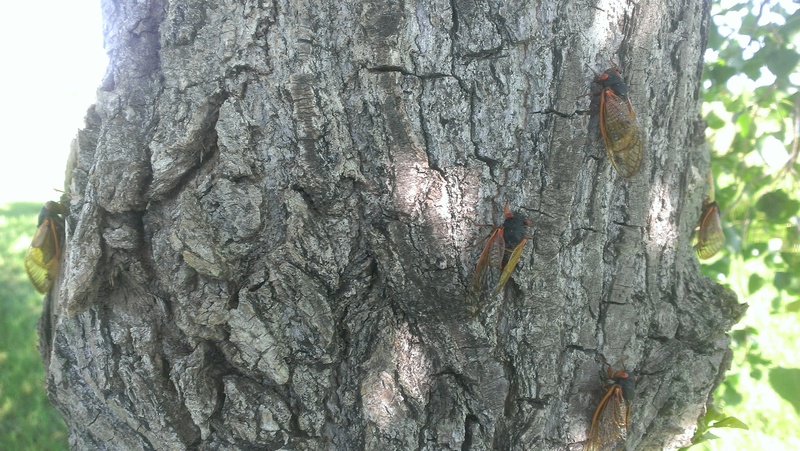 Yes, the 17 year Cicadas are here! It has been 17 years since they came. 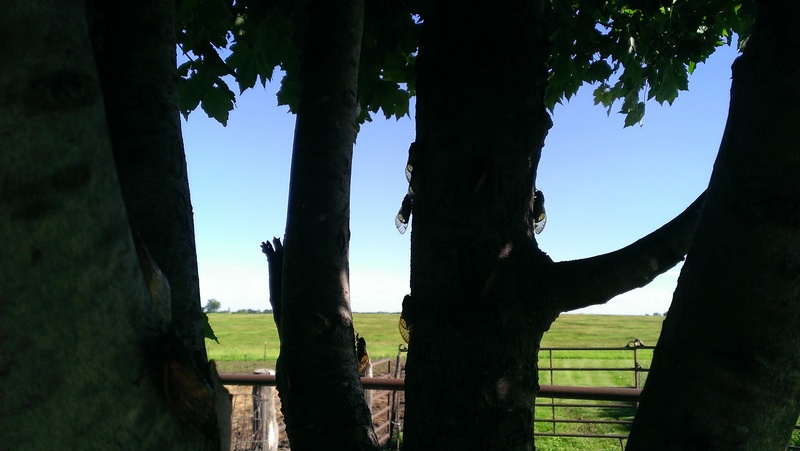 This tree behind our chicken house was loaded with them all the way up the tree. 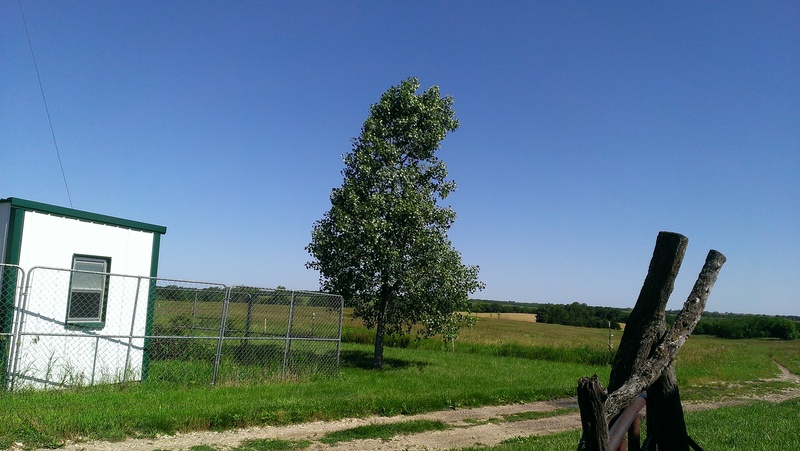 And this is a tree out by the horse pen. I have had to clean out the horse tank several times. Lots of drowned Cicadas in the water. 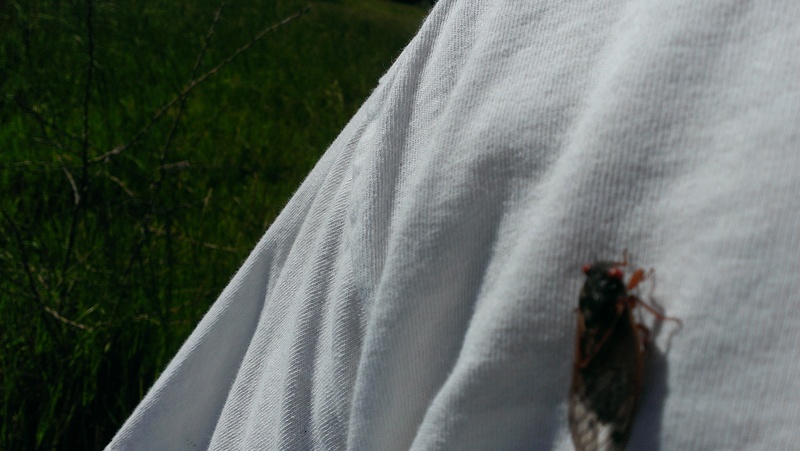 They even landed on Hubby’s shoulder while we were on the ATV checking on the calves and cows. We were also hoping to find the latest heifer born yesterday evening so we could tag her. She is nursing and doing well so far I am glad to say. 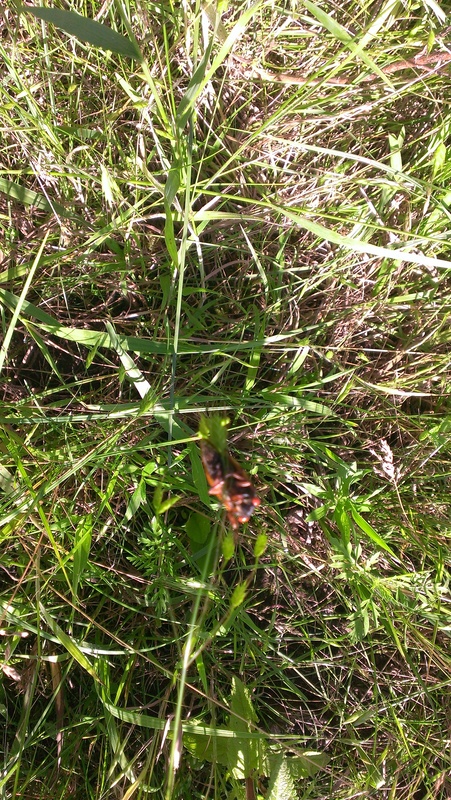 You may not be able to see it very well, but the Cicada is on a thin stem of grass. You may have to click on the picture to make it bigger to see it better. 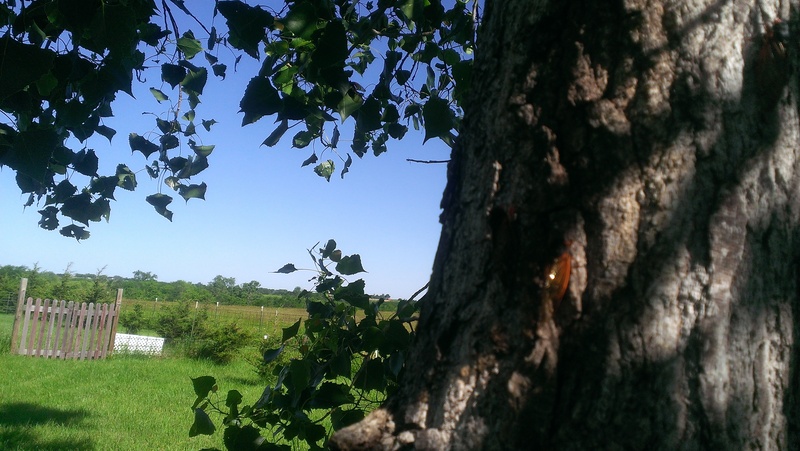 It is the red spot around the middle of the picture. We never got our eye on the calf or the cows. It was about mid morning and it was already getting warm. The cows must have gone to the shade early. It is hard to see black cows in dark shadows of shade. Glad to hear your got a healthy calf on the ground. Congratulations and phew! 🙂 Now those bugs….ugh! 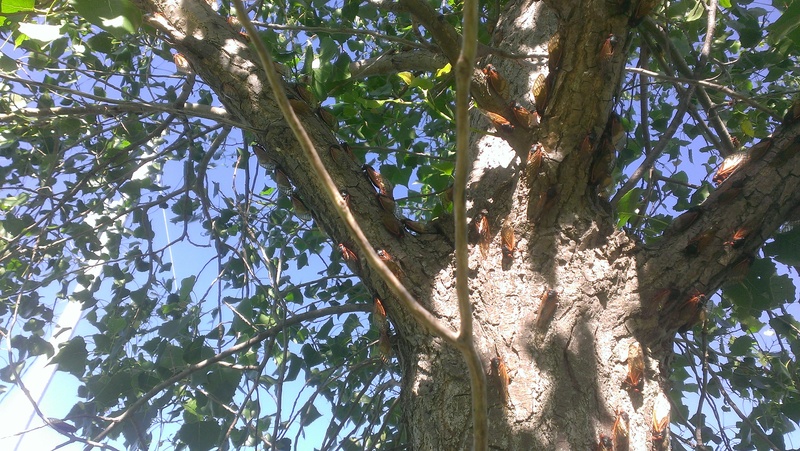 Is it not odd for the dogs to actually eat the cicadas, after all they’re bugs. My dogs won’t touch bugs, thank God.